In the photo below is my power test setup at home. Unfortunately, where my other shop is right now, I am unable to make changes like this. Here I explain what I did to get around that and make power progress! Now that the ReactorForge is back on the bench it’s time to get it powered up! This setup isn’t necessarily something that an inspector would like to see. So don’t think this is my recommendation for a permanent solution. I’m just sharing what I did to make my current setup work. Keep in mind the breaker should always be OFF before connecting or disconnecting wires on the quick disconnect assembly. To hook up 240 to the ReactorForge in this shop I have to run a temporary line. I don’t want to have to remove the breaker each time I do this, so I made an enclosure that mounts in a breaker slot. The assembly houses 3 Burndy splicers (PN: AMS2BAG2R). It does a few important things, it isolates them from each other, from the breaker box, and it snaps closed to prevent the lugs from sliding out (and attacking passer buys). On the side where the wires enter the assembly from the breaker, it is closed off except for holes just big enough for them, so it’s impossible for the splicers to slide out from that side. There are also ears on the front to keep the entire assembly from sliding all the way in the breaker box. I printed a quick test in PLA, made a few changes and am ready to 3D print the final version in nylon after Thanksgiving. I’m sharing all the files here in case anyone else finds it useful. Be smart, be safe. My problem is that I do not want to open up the panel and remove the breaker and wires every time I need to remove the temp line. So I drew a simple small enclosure to house some common splice blocks made by Burndy. *Tip: I usualy try to make a technical drawing before I 3D print a part. 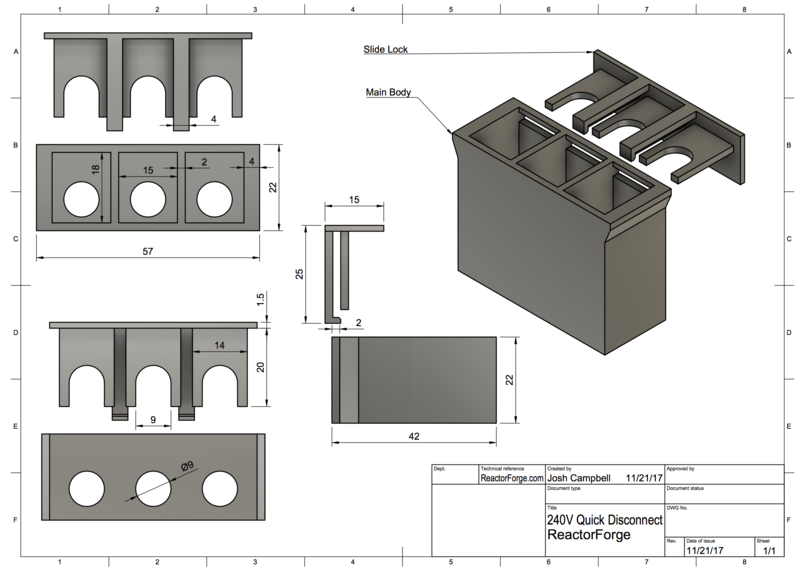 It’s quick and easy in Fusion 360 and saves me wasted prints and time redrawing later. I always catch a lot more looking at the drawing with multiple views and mesurements than just looking at the drawing in the viewport.